At Salisbury Optical, we take the time necessary to properly examine every patient so we can prescribe them with the correct prescription for eyeglasses. Our friendly and caring staff will work one-on-one with you to help you find the perfect pair of glasses to fit your needs. 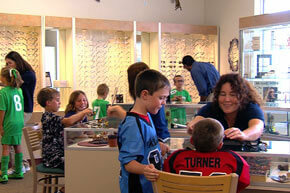 Each pair of eyewear is chosen based on individual preferences and needs. We offer corrective prescription lenses and a variety of additional benefits such as thinner and lighter, anti-glare, scratch resistant, and Transitions lenses. We have more than 700 name-brand and designer frames, such as Jessica McClintock, Izod, OP, Anne Kline, Kenneth Cole, Cover Girl and fashion frames for every individual taste and style. 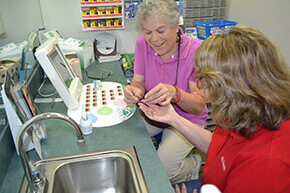 Doctors Kenneth Bortnick and Jeff Jolley offer thorough eye exams for contact lenses to patients of all ages. If you’re a first time user of contacts, we can give you instructions on how to properly use them. For more information or to make an appointment, call one of our locations today! Superior CLARITY with Real-World Toughness. What does superior clarity mean in an eyeglass lens? How about the near elimination of distracting glare as well as scratches and smudges that interfere with your vision? Lenses that are easy to keep clear and clean, and are tough enough to last as long as your prescription? ZEISS DuraVision Platinum, the anti-reflective lenses setting a new standard for clarity, cleanability and toughness. Your vision is sharper in high-glare conditions such as driving at night or working on your computer, and others can see your eyes more clearly. ZEISS DuraVision Platinum reduces light reflections by over 20% compared to other anti-reflective lenses, giving you maximum clarity, day and night. ZEISS incorporates advanced technology to keep your lenses cleaner, longer.